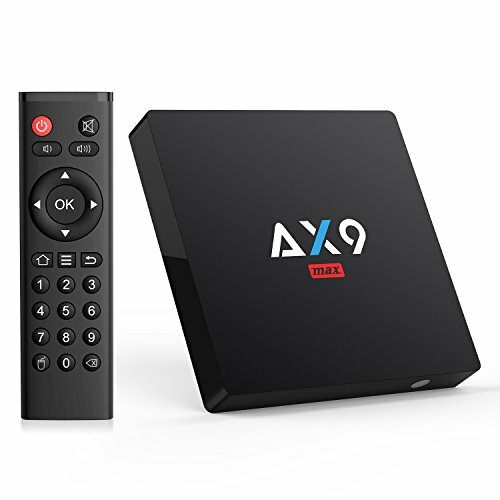 [New model]- AX9 Max TV box has advanced high-performance CPU Quad Core ARM Cortex-A53 and GPU Penta Core ARM Mali-450. Much more stable and fast computational performance. It can be installed and set up quickly, the performance is absolutely fluid and playback is great with no buffering and crash or jerk. [Latest operating system]- Updated android 7.1 OS, the newest Generation of smart android tv box. It brings you ultra-fast running speed and different experience. [Memory & Expandable Storage]- DDR3 2GB RAM and EMMC 16GB ROM bring you high speed and great large storage to view websites, play online games, watch tv shows and sports programs, etc. It can meet wonderful experiences for you. Extended USB Mechanical Hard Disk 2.5/3.5inch up to 4TB Storage, much space for your entertainment. [4K Clear view]- Powerful H.265 video decoding technology with WIFI 2.4GHZ offer a stable WIFI signal, and loads resources by taking half time and half occupation of bandwidth of H.264 decoding, it is more faster and stable. Based on H.265 HD decoding, it offers 4k * 2k output which provides you high definition viewing and fluent video playing, making it as the highest resolution signal available for home movies.